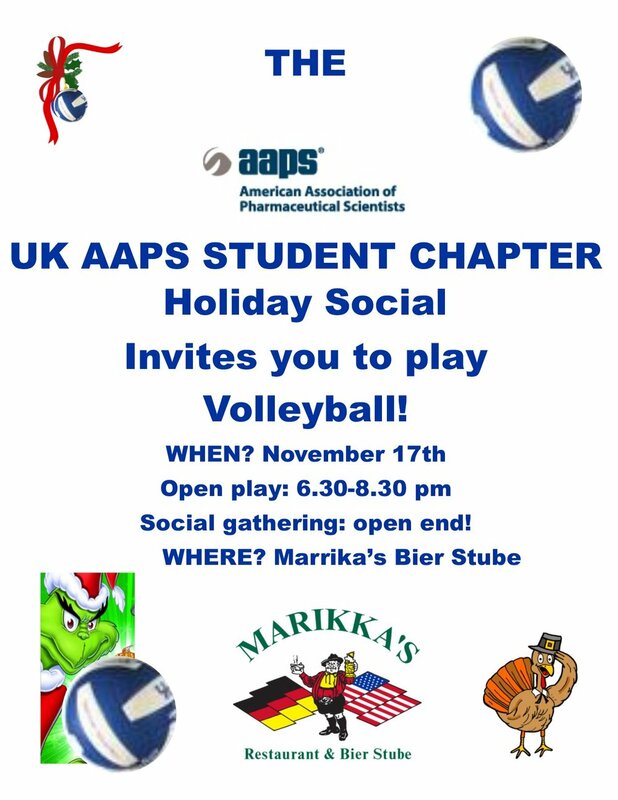 Graduate Students and Postdocs met at Marrika’s for a few hours of beach volleyball just before the holidays. Our chair Freddy Arce made this video for the award presentation. Watch it here! AAPS trivia night at Campus Pub was a full success! Thank you to everyone who came out and played! Thanks to Local Trivial Action for helping us out! Congrats to the Poptarts on their win! On August 20th, the AAPS Student Chapter organized a trip to Eli Lily in Indianapolis, IN. The trip included presentations from students and Lily employees as wells as tours of the facilities. Today we received the good news that our student chapter was selected for the 2018 AAPS Student Chapter Award. Thank you very much to Freddy Arce and Emily Dennis for all their hard work with the application. And also a big thank you to the AAPS Board of Directors for selection our chapter! This year, the DDDC was a collaboration between the University of Arkansas Little Rock and the University of Kentucky. The talks were comprised of featured speakers as well as many graduate students and post-docs and covered a variety of topics from cannabinoid agonists, to cancer, to natural products. The AAPS president, Christopher McCurdy, gave a talk about his research on developing molecules for imaging areas of pain and inflammation. The full schedule ca be found here. Each day there were opportunities for students to interact with the speakers including poster presentation, a panel discussion, and a Young investigator’s roundtable & breakfast. A big thank you goes out to our chapter members on the organizing committee, Ashley Lay and Taylor Lundy, as well as Shou Zhou, Dr. Joseph Chappell, and Catina Rossoll. More pictures from the event can be found here! On Friday, June 8th, the AAPS Student Chapter organized a Qualifying Exam Panel Discussion. Dr. Feola, DGS of the Pharmaceutical Sciences Graduate Program, gave an overview of the rules and procedures as well as some tips for the preparation. Afterwards, Post-Qual Students from all 5 tracks answered questions of Pre-Qual Students. Thank you to Taylor Lundi (MBCC), Brooke Johnson (MBCC), Kanika Sarpal (PCE), Julia Schulz (PET), David Henson (CET) and Pratik Doshi (POP) for the participation! On May 29th, our AAPS Officers teamed up with SciCATS, a organization that brings science into the elementary school classroom. During the weekly meeting, the organizers and students made their own very delicious ice cream with ice cubes, salt and two different sized Ziploc bags. Measured out all the ice cream ingredients and place them in the quart-sized bag. Rolled the ice cream in the gallon-sized bag with the ice and the salt. On Wednesday, May 23, Rachel Krasich, a Research Scientist, and Erica Forrest, HR, from Camargo Pharmaceutical Services, based in Cincinnati, Ohio, visited the college. They gave a seminar about "A Day in the Life of a Camargo Research Scientist" and a few tips about interviewing and resume building. It was a very informative, fun session. On Saturday, April 21 Emily and Julia manned our table at Expanding Your Horizons, a STEM conference for middle school students. They did the red cabbage pH experiment, a colorful and fun science experiment. The students determined the pH of orange juice, soda, salt water, bleach and soapy water. On Tuesday, April 17th Dr. Dan Mudra and Dr. Mike Wiley visited from Eli Lilly as part of the AAPS Visiting Scientist Program. They gave a seminar titled “Find Out What You Don’t Know – A recurring lesson from years of lead generation research.” They joined students for breakfast, lunch, and a breakout discussion (pictured) focused on learning from their career experiences and discussing future directions of the pharmaceutical industry. Today a few of our members did a showcase at the UK Engineering Day! They demonstrated amorphous states by flash freezing flowers and fruits in liquid nitrogen as well as the function of enzymes and catalysts with elephant toothpaste! It was a blast! Thanks to all the helping hands for making it possible!